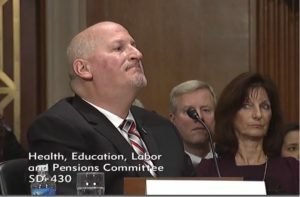 OK, now that the dust has settled, what do we think about the performance of OSHA Assistant Secretary nominee Scott Mugno after listening to his testimony at his confirmation hearing on Tuesday (and Tweeting it)? You can watch the entire hearing for yourself here. Two days after the hearing, there hasn’t been much press coverage. Sen. Murray said Mr. Mugno has “consistently opposed stronger safety and health protections for workers,” including OSHA’s respirator and ergonomics standards, and asked him if there has ever been an OSHA regulation that he did support, to which he replied that he did not recall whether he has written any comments in support of any OSHA regulation. Well, actually I’m not so sure we haven’t had OSHA directors with that background. Reagan’s first pick, Thorne Auchter, had a business background as chief safety and health officer for his family’s construction firm and Reagan’s second pick, John Pendergrass, along with George W. Bush’s fist pick, John Henshaw, were private sector industrial hygienists (Pendergrass at 3M and Henshaw at Monsanto) prior to coming to OSHA. George H.W. Bush’s Assistant Secretary for OSHA, Jerry Scannell, had been head of safety at Johnson & Johnson and an OSHA official in the 1970s. Well that’s true. He’s probably no Scott Pruitt. As far as no being “a proponent of hyper-aggressive regulation,” no OSHA head, Democrat of Republican, has ever been a proponent of “hyper-aggressive” regulation (whatever that is.) But, of course, the question in this administration is not about “hyper-aggressive” regulation. Given Republican history in this area, Trump’s pride in slashing worker and environmental protections and legally and morally questionable one in/two-out regulatory Executive Order, the question is whether there will be any new worker protections at all. But there’s no denying Mavity’s observation that Mugno’s initiatives — especially in pursuing a more collaborative approach — will be hampered by the agency’s lack of resources, “There’s been a lot of lip service paid, but no president since the agency was created has ever adequately funded it,” he said. On the whole, I wasn’t all that impressed with Mugno’s performance. Despite the nice things that his business colleagues say about him, nothing particularly positive stood out at his hearing. And there were some significant negatives. Well, no, you don’t recall correctly. Not even close. The last complete budget passed (FY 2017) had a flat enforcement budget ($208 million). OSHA is currently operating under a continuing resolution, but the Trump budget proposal for FY 2018 proposes a small half million dollar cut in enforcement, while the House budget bill proposes a devastating $13.5 million (or 6.5%) cut in enforcement below the FY 2017 budget. The Senate bill would keep enforcement funding flat. He would have to go all the way back to FY 2010 to find an increase in OSHA’s enforcement budget. Now, maybe I’m a bit sensitive about the OSHA budget, but I spent the last 8 years at the agency and not a day went by that I didn’t have at least one discussion about OSHA’s budget problems. So I find it hard to understand how, after multiple hours of briefings he most likely sat through to prepare for this hearing, he somehow failed to ask about OSHA’s budget. And apparently no one doing the briefing thought to educate him about it. He also tried to weasel out of that answer by saying that “In not writing comments I would argue that those were things we obviously thought were well worth it.” Yeah, nice try. But no. The Chamber of Commerce is not shy. When they actually support something, they are not quiet about it. When the AFL-CIO or other organizations support an OSHA standard, they provide written comments and evidence in support. They testify at OSHA hearings. They make positive statements to the press. In the political and regulatory struggles that define our nation’s capital, silence has never meant support. Support means support. Opposition means opposition. And silence means nothing. Coincidentally, I just ran across a forgotten article from 2002 in the National Safety Council magazine where I “debate” Mugno about the demise OSHA’s ergonomics standard, one of the greatest tragedies of American occupational safety and health history. For those of you born yesterday, the new Republican Congress and President repealed the standard in March 2001 using the recently passed Congressional Review Act. This came after a decade of work initiated by George H. W. Bush’s Labor Secretary Elizabeth Dole and culminating in the long-awaited issuance of an ergonomics standard in late 2000. Today, more than 15 years later, ergonomic issues continue to comprise a third of all occupational injuries and illnesses. Mugno, who is about to be in charge of OSHA intervention and oversight, defended the repeal of the ergonomics standard stating that “Companies are capable of improving workplace safety, without constant OSHA intervention and oversight.” Mugno pushed the empty argument that there is no universally agreed-upon definition of a musculoskeletal injury and therefore “safety professionals cannot provide clients with the advice and consultation required.” He sought to cast doubt on the science, following the familiar path of industry opponents of all OSHA (or public health) standards as described by former OSHA head Dr. David Michaels in his seminal work, Doubt Is Their Product: How Industry’s Assault on Science Threatens Your Health. Mugno concludes that “strong market incentives” and not government regulation are all that’s needed and even state standards (like California’s) divert resources from “several promising initiatives the company would rather have worked on” because the company is forced to defend itself in court. All troubling opinions (to say the least) from the person soon to be in charge of oversight of corporate compliance with safety and health standards in this country. On the surface, the Congressional “debate” was about the alleged flaws of the Clinton standard. But this drastic and unprecedented action was much more about politics and ideology than about facts and protecting workers. The congressional vote was actually the culmination of 10 years of attacks on the science behind ergonomics; battles over stop-work orders from Republican-controlled Congress; industry opposition to state standards in California, Washington and North Carolina; opposition to ergonomic guidelines; and dire warnings from business associations that a federal ergonomics standard would foretell the collapse of capitalism. And that was fine with most of the Senators. But not Elizabeth Warren, who despite now having served almost 5 years in the Senate, hasn’t accommodated herself to the typical answers that Congressional witnesses give. Warren pressed Mugno about OSHA’s failure to issue press releases for large enforcement cases, noting that the Obama administration had issued around 400 press releases a year, and in the first ten months of the Trump administration, only 36 releases had been issued. You can watch the fireworks yourself at hour 2:18 of the hearing. Continuing Republicans’ love affair with OSHA Voluntary Protection Programs, Chariman Alexander asked Mugno whether he supports the program and will support Senator Enzi’s bill to expand it. (First, we should note that the VPP legislation that Alexander is referring to (S. 1878) doesn’t actually call for expanding VPP, it only codifies the program into law using certain criteria for participation. Right now, VPP is an OSHA program that exists under current law with no independent legislative authority. Funding comes out of OSHA’s compliance assistance budget line. Mugno only commits to “consult with the Secretary as well as the career OSHA staff to make that expansion better.” Alexander is clearly more patient with that type of answer than Senator Warren. But I don’t want to leave here without bestowing some praise where praise is due. He said that he fully respects the role that organized labor has played in the safety arena over history and noted that as a former union member he had filed some safety and health grievances. He looks forward to making workplaces safer while always abiding by OSHA’s mission and laws. Normally I’d yawn at that, but a strong commitment to abiding by an agency’s mission and the law is becoming increasingly rare in this administration. Barring some political meteor hitting him in the form of sexual harassment accusations or the revelation that he’s a drug kingpin in his spare time, Mugno will be confirmed by the Senate. He doesn’t seem like an ideologue bent on the destruction of everything the agency standards for (like Scott Pruitt at EPA), although he’s a bit too close for comfort to the Chamber of Commerce who, despite Mugno’s excuses, have never seen an OSHA standard or enforcement program they’ve liked. He’ll probably try to focus more on compliance assistance and VPP, but will be somewhat restricted by the budget and the realization that despite corporate and Republican myth, the Obama administration also put a strong emphasis on cooperation and compliance assistance. As a safety and health professional, he may even want to do something positive like expanding OSHA’s budget or push forward on some less controversial parts of OSHA’s regulatory agenda (cell towers? tree care? ), but it’s unlikely that he’ll be a strong enough voice to overcome the hostility of the White House or the desire of Secretary Acosta not to make any waves. My bet will be no significant action on anything. The budget situation — and OSHA’s effectiveness — will continue to deteriorate. No new standards will move. Lip service will be paid to less confrontation, more cooperation and expanding VPP. We have no indication where he’ll go on weakening the new recordkeeping standard or the beryllium standard as the comments are considered. And most of those decisions will likely be made in the Secretary’s office or at OMB. Where will he fall when it comes to making decisions about new emphasis programs, difficult general duty clause cases or high penalties, and how submissive will the agency become on corporate settlement agreements? Will he strive to maintain VPP’s integrity or try to grow the program? With the current budget, he can’t do both without further impacting enforcement. I am an ex FedEx Aircraft mechanic employed at Los Angeles LAX maintenance facility. I was retaliated against and ultimately terminted by Fedex management for making complaints of improper repairs, falsifying aircraft documents in order to avoid costly repairs and more. I brought my complaints to the FAA and OSHA whom were both seriously compromised by Fedex’s political power. OSHA ultimately did nothing but retaliate against my investigator, Darrell Whittman for his willingness to investigate FedEx against his Supervisors wishes along with other cases ultimately resulting in his illegal termination also. I at the time and after my termintion reached out to people from fedex from management on the floor to the CEO Fred Smith, there was no one within that orginization that was interested in acting on behalf of the safety of their employees or in the interest of the publics safety. Their only interests were to discredit myself and avoid any consiquences for their safety violations and illegal acts. The hiring of any FedEx Management to oversee the safety and welfare of the people of this country would be a tragedy for the American people, and a victory for corrupt corporations. I recently published an ebook titled “The Memphis Electric Chair Company” that is free for download at my personal website www.guycobb.com . I have an entire chapter dedicated to Scott Mugno’s failures as Safety Director at FedEx that I documented over the past eleven years. Pingback: Today’s Workplace » Scott Mugno: Rising from the Dead?